Ultimate Fighting has been around for some time now. But despite growing attention to the sport of Mixed Martial Arts in the last couple of years, it had still been considered a niche sport. Until this weekend. It was the night of UFC 100, the night the sport hit the mainstream. The night the sport found its identity. The night the sport found its 6'4" 265 poster boy. Brock Lesnar's story is known to many. Former NCAA Champion wrestler becomes WWE star while still in his 20's. He gave the NFL a try but didn't make it, and is now the top man in a surging sport at age 32. But his name recognition just climbed several notches on the popular culture ladder with his dominant heavyweight title defense over Frank Mir, avenging his only MMA loss. But winning the fight in lopsided, brutal fashion wasn't enough. He gave the most memorable postgame interview I have ever seen. Lesnar shamed the man he just destroyed...and did it in front of Mir's hometown fans in Las Vegas. He also spoke of having marital relations later in the evening. And maybe most outrageously of all, he totally dissed the event's main sponsor, promising to drink another brand of beer. Here we had real sport with real competition that (unlike boxing) is well-managed and organized. But it still had the showmanship of pro wrestling. Lesnar's statement win was the headline on espn.com and don't be surprised if he's on the cover of this week's Sports Illustrated. 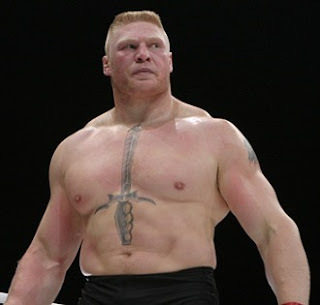 Now we have to wonder - did Lesnar go off the reservation on purpose or was that the sport's master plan? Or does it even matter now? The floodgates are open.